Barclay was a well known illustrator and artist who was very active until the onset of WWII. He was lost at sea in 1943 while serving his country in the Navy. 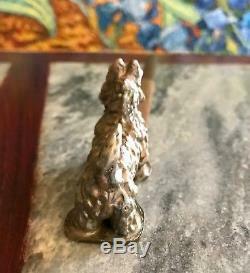 Barclay's art work is highly prized by collectors and continues to appreciate in value. 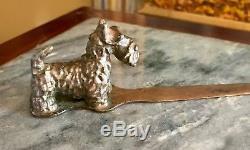 Barclay made several copper works of art using a Scottie in the design. 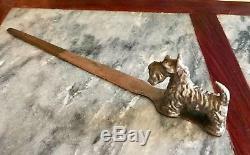 The letter opener is in very good condition with expected wear. 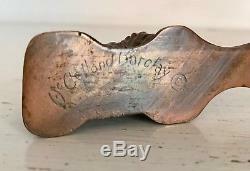 The copper has a nice patina with a few spots of tarnish, surface scratches and staining. It could be polished by the new owner. The tip of the letter opener does not bend as is common with older letter openers. There are no cracks, breaks, scraps or big scratches. 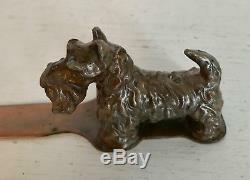 The letter opener is heavy at 167.4 grams (mostly the weight of the Scottie). 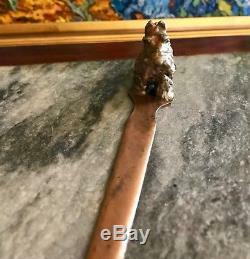 This is a great opportunity to acquire a rare and beautiful vintage copper letter opener made by well known American artist McClelland Barclay. 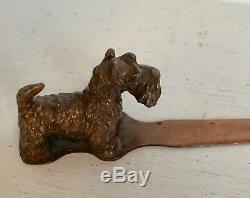 Perfect for a dog lover, for desk art or to add to a collection of fine letter openers. No charge for packing materials. Please examine the photos to assess the condition for yourself. Other items shown in the photos are for display purposes only. 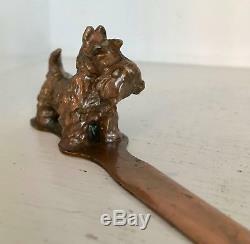 The item "Rare Old 8 McClelland Barclay Copper Scottie Letter Opener Circa 1932 Signed" is in sale since Tuesday, August 14, 2018.